Anatomic Pathology is a branch of science which involves in molecular, biochemical and microscopic analysis of tissues and organs in order to find effectiveness of diseases. Main objective of anatomic pathology is identification of abnormalities to manage treatment and diagnosis. This can be helpful diagnosis of different types of cancers. 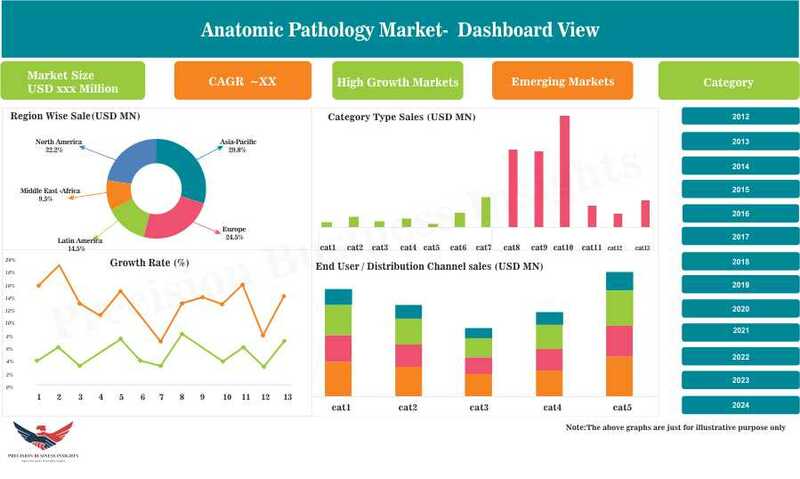 Anatomic Pathology market is driven by growing prevalence of chronic disease, increase in geriatric population, rise in initiatives taken by the government in order to prevent the diseases. Furthermore, rise in incidence of STD’s, changes in lifestyle of people, increase in awareness regarding diseases and their preventive measures are expected to propel the growth of the market. On the other hand, lack of awareness in developing countries, high cost of the process are dampen the anatomic pathology market. The Anatomic Pathology Market is classified on the basis of product type, application, end user and regions. Geographically Anatomic Pathology Market is segmented as Latin America, Europe, Asia Pacific, North America, and The Middle East and Africa. North America is expected to remain the dominant market in global anatomic pathology market throughout the forecast period, followed by Europe due to more number of players are expected to enter into the former market during the forecast period. Japan is expected to be the next lucrative market for companies, and the market is estimated to register good revenue over the forecast period. Asia Pacific is expected to grow at fastest CAGR during the forecast period due to rising penetration of the digital imaging in emerging economies, growing investments in medical field, and the presence of untapped opportunities. Asia Pacific healthcare industry has highly influenced the anatomic pathology due to increased incidence of cancer, geriatric population pool. Increasing demand for novel treatment options, better patient care facilities, and reduction in laboratory expenses are expected to drive demand in the coming years.